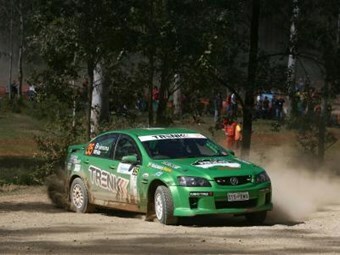 Holden Commodore driver John Bruinsma has rapidly made a name for himself in the Bosch Australian Rally Championship with his spectacular tyre shredding V8 thrilling spectator crowds across the country. Although Bruinsma only arrived on the scene in 2010, the West Australian has quickly risen to prominence as a result of his vehicle selection and it's hard to miss the sight and sound of the ground shaking six-litre V8 Holden pounding through the forests! "When we decided to try our hand at the ARC first off I wanted a good, strong car," explained Bruinsma. "It had been years since a new Commodore had been rallied and no one had ever campaigned a VE Commodore and I liked the idea of the challenge. It's definitely different but I think it's fun to be different!" So far it's worked, with spectators flocking to the Super Special Stages and forestry vantage points to watch the bright green V8 spectacularly sideways as Bruinsma throws caution to the wind in the most entertaining way. "I'd been involved in rallying in my early 20s but gave it up because of the cost. A couple of years ago I got a chance to go for a ride with Dave Thompson in his big V8 and the rest is history. Within a short period of time I'd bought a car and set my sights on the ARC. "Almost two years later it's been a fantastic experience," continued John. "Sure it's been hard learning the intricacies of top level rallying but it's been fun. Early on it was hard for people to take us seriously, but as we've been doing well and been competitive people's attitudes have changed and we've been really well supported." The rear-drive Commodore, eligible for the two-wheel drive title in the Bosch ARC, currently sits at the top of the points ladder after two rounds, leading the Ford Fiesta of Razvan Vlad and the Honda Civic of Eli Evans. "When I got back into rallying I always thought the sport should head in the two-wheel drive direction. The problem I see with the Mitsubishi Evos and Subaru WRXs is that they just aren't current to the market anymore, people are buying two wheel drive sedans and hatchbacks." "Even when you look at the WRC these days you can't buy a four-wheel drive turbo Fiesta or Citroen, and I wonder how relevant they are to the average person watching and thinking about buying a car. "I'd put V8 Supercars in that category as well, the car I rally is the car you can go into a dealership and buy, you can't say that about a V8 Supercar," said John. With the Bosch ARC making two-wheel drive the dominant category from 2013 Bruinsma remains realistic about any ambitions for outright victory. "My goals are very realistic goals, I'm here to have fun more than anything, however I do take my rallying seriously and we're already in the early stages of looking at vehicle options for the future." Bruinsma is still developing the VE Commodore and has a number of major improvements coming for the next round of the Bosch ARC. "For Scouts Rally SA we've got a brand new motor going in as well as a new exhaust which should deliver a lot more torque and former Australian Rally champ and suspension guru, Murray Coote, has been working on the rear suspension," explained Bruinsma. "I am hoping the improvements will improve my stage times while adding further spectacle to the process," he added. So keep an eye, and an ear, out during Scouts Rally SA, the gravel-spitting, tyre-shredding VE Commodore is just around the corner!